The ignominy of metallic pallor disguises this guardian of the public good as it hangs in vigil amongst the myriad ecstasies of Blissville in Queens. 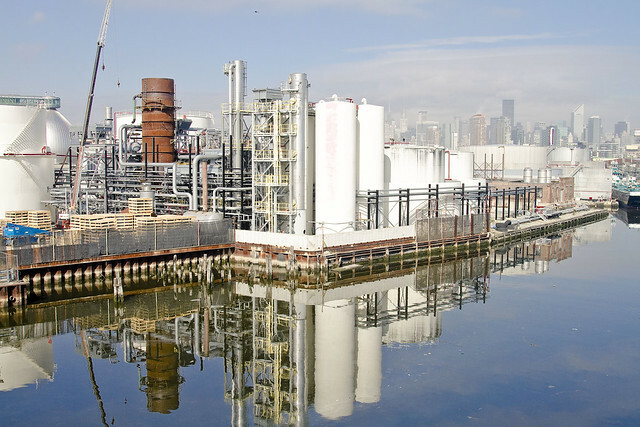 Deep below the cement and soil of this ancient village surge the ground waters of the Newtown Creek, and in nearby Greenpoint titan industries form the energy and wastewater backbone of New York City. Never quiet, Greenpoint Avenue is its home and the hoary byway is ennobled by its long and thankless service. I’ve been fascinated by this structure in West Maspeth, or Berlin if you’re of a certain mind, for some time. 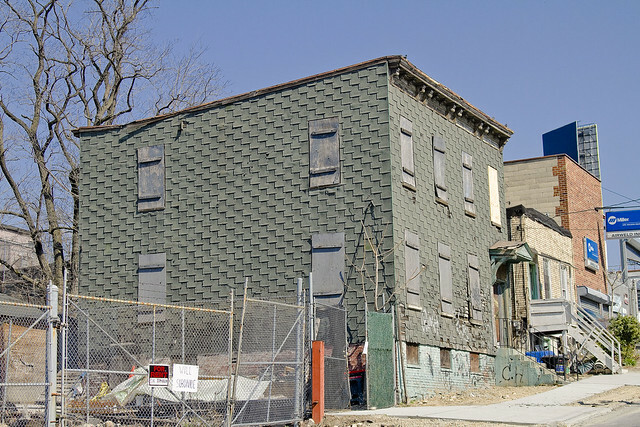 It’s 4411 54th avenue, and it looks as if things have taken an ominous turn for this old girl. According to the public record, this is a 2,030 ft. multi family dwelling which was erected in 1915. 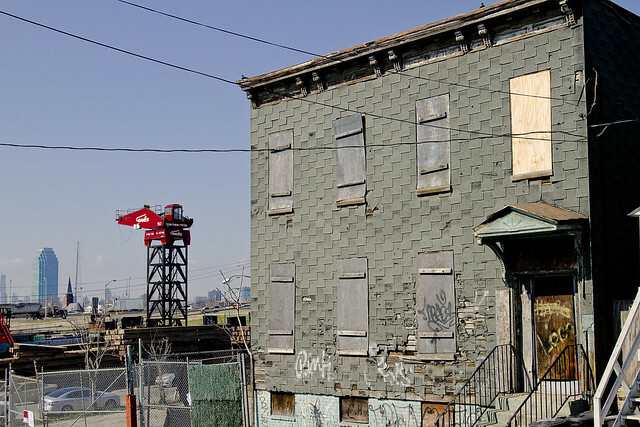 Real estate industrial complex sources price it at around a half million bucks, which is an incredible number given its neighborhood of heavy industry, highways, cemeteries, and a nearby superfund site. Additionally, the Kosciusko Bridge reconstruction will be happening just a block away, which promises ample nighttime noise due to construction. The hill of Laurels, literally covered in Laurel trees, was what Calavry cemetery was carved into in a period between (roughly) 1848 and 1860. The modern day Laurel Hill Blvd, and the present Kosciusko travel through the shallow valley which separated it from the next hill- Berlin Hill. This house on 54th avenue was built in a time when the area was still called that, before the first world war made such nomenclature less popular. I’ve heard the neighborhood referred to as either West Maspeth (or just plain Maspeth) by people who live here, so I guess that’s good enough for me. Personally, I always think of western Maspeth as the area around the Clinton Diner, with DeWitt Clinton’s mansion and St. Saviours and the town docks nearby at the head of Maspeth Creek which was at one of those tripartite corners you can find only in Queens- 56th and 56th and 56th. At any rate, this building has one of those fire department boxed hash marks painted on its wall, the one that says don’t risk a life trying to save this place. 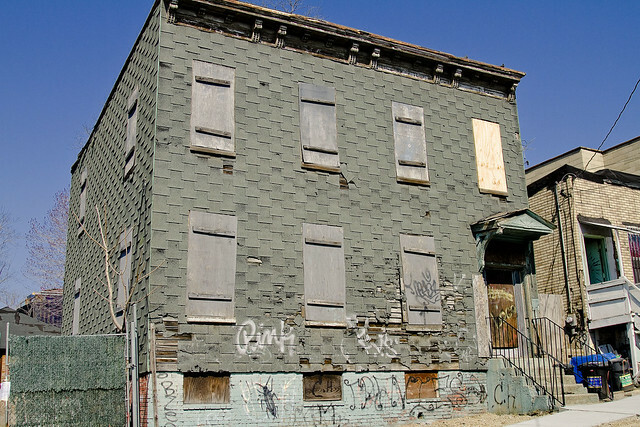 It’s a shame, really, imagine what this shunned house on the hill must have looked like “back in the day”. Just a short one today, some of the interesting odds and ends observed during my travels over the last few weeks. The shot above is from 58th rd. 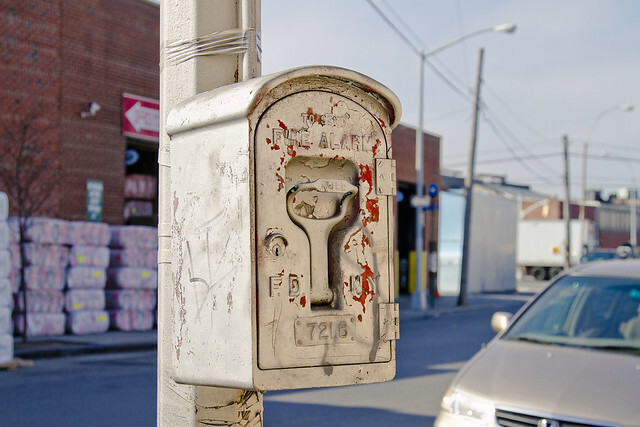 in Maspeth, once known as the Maspeth Plank road and paved with crushed oyster shells. It led to Furman’s Island, a notorious spit of muddy land that was legendary in its time for the offensive industries located there. This curious collection of women’s shoes, singles not pairs, was spotted on Provost in Greenpoint, Brooklyn. 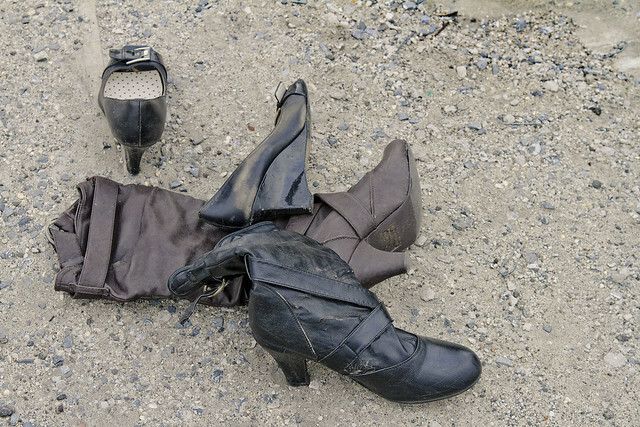 The mind boggles at where the mated shoes might have been dumped, but these are found on the street named for one of the “OG’s” – the Original Greenpointers. They were named Provoost rather than Provost, of course, but Dutch words seldom translate unscathed into english. Also in Greenpoint, this time nearby Manhattan Avenue. Manhattan is a double wide street because there was a street car or Trolley line that ran down it, which broke off from the East River to Calvary line which plied Greenpoint Avenue. The Manhattan Avenue line went over the Vernon Avenue Bridge and connected with Long Island City. 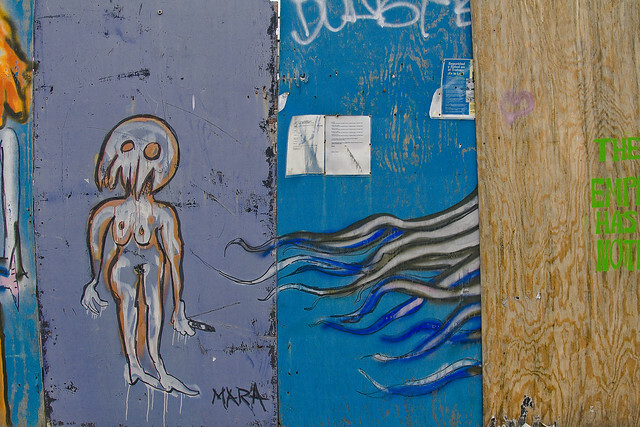 The street art or graffiti depicted in this shot is signed “Mara” and a humble narrator is glad that some of the conclusions I’ve drawn about Newtown Creek are seemingly being noticed by others. As mentioned in the Newtown Pentacle posting “Approaching Locomotive“, a recent opportunity to visit the gargantuan Waste Management facility on Varick Street in Brooklyn (whose back yard abuts the English Kills tributary of the fabled Newtown Creek) materialized. your humble narrator has long desired to witness the place, so I jumped at the chance. 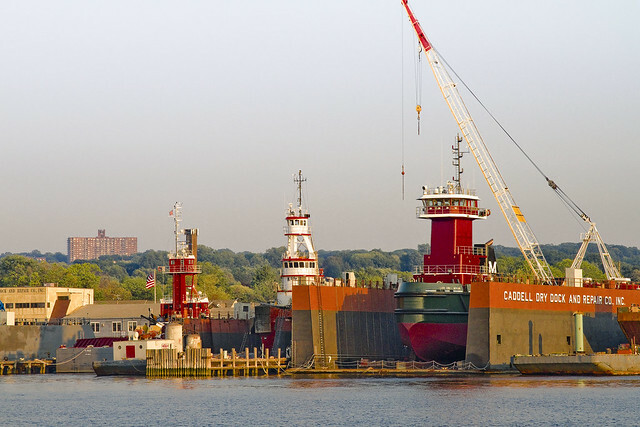 As a note- I’m a member of Newtown Creek Alliance, and so is one of the subjects of this posting. Said admission is offered in the name of avoiding charges of bias, nepotism, or cronyism. Waste Management, Inc. (NYSE: WM) is a waste management, comprehensive waste, and environmental services company in North America. Founded in 1894, the company is headquartered the First City Tower in Houston, Texas. The company’s network includes 367 collection operations, 355 transfer stations, 273 active landfill disposal sites, 16 waste-to-energy plants, 134 recycling plants, 111 beneficial-use landfill gas projects and six independent power production plants. Waste Management offers environmental services to nearly 20 million residential, industrial, municipal and commercial customers in the United States, Canada, and Puerto Rico. 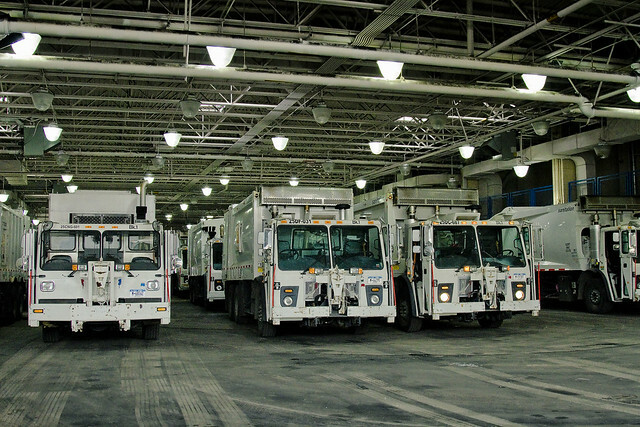 With 21,000 collection and transfer vehicles, the company has the largest trucking fleet in the waste industry. Together with its competitor Republic Services, Inc, the two handle more than half of all garbage collection in the United States. Accompanying a class of high school students from “The Green School” on Graham Avenue in Williamsburg, we arrived at the Titan depot early in the afternoon. Early for the diurnal, of course, but late in the day for the Waste Management folks who get more accomplished before sunrise than most do by sunset. 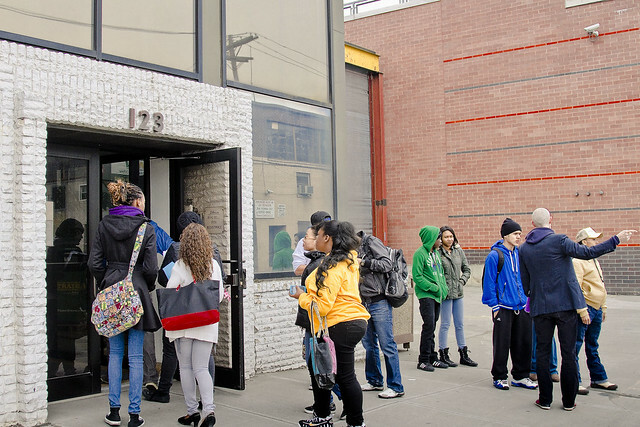 The Green School is a 9th-12th grade learning community that develops science, math, literacy, and social studies skills in the context of New York City’s many environments. Through rigorous interdisciplinary curricula and hands-on experiential projects, students will engage with their environment, participate meaningfully in community life, and prepare for their futures. While focusing on “green” careers, the school’s primary theme is sustainability, a concept and a practice that incorporates and recognizes the interconnectedness of the environment, the economy, society, and culture and promotes practices with the future in mind. The curricula focus on giving students scientific, historical, and contextual knowledge to make meaningful connections between their lives and the broader world, and the math and literacy skills they need to participate in that world. Students are able to demonstrate mastery of academic work in portfolios, examinations, and reflections by applying it to the world around them, explaining the geometry in the arc of an elevated train, deducing air quality using the scientific method, or designing and carrying out learning experiences for local elementary students. Students participate in community service projects, internships and apprenticeships, and do independent projects based on their interests each year. The mission of The Green School lends itself to create a school environment open to the diverse needs of ELL, special education, gifted and struggling students. The Green School is committed to provide all students an education and the required skills that are transferable from the classroom to their collegiate and/or professional pursuits. The two fellows at either end of the shot above are Newtown Creek Alliance’s Michael Heimbinder and Marc Ottaviani, 11th grade English Language Arts teacher. Michael, in addition to his NCA work, is involved in several other projects- one of which is habitatmap.org. Michael Heimbinder is a writer, researcher, community organizer and information designer. Over the years he has collaborated with a wide range of environmental and human rights organizations including the Newtown Creek Alliance, the United Nations Equator Initiative, the Ghana Wildlife Society and Food First. He is also a Fellow at the Oakland Institute and a technical advisor to the Organization of Waterfront Neighborhoods where he consults on solid waste management issues in New York City. Michael is a graduate of Colorado College and received his M.A. in International Affairs from the New School for Social Research. 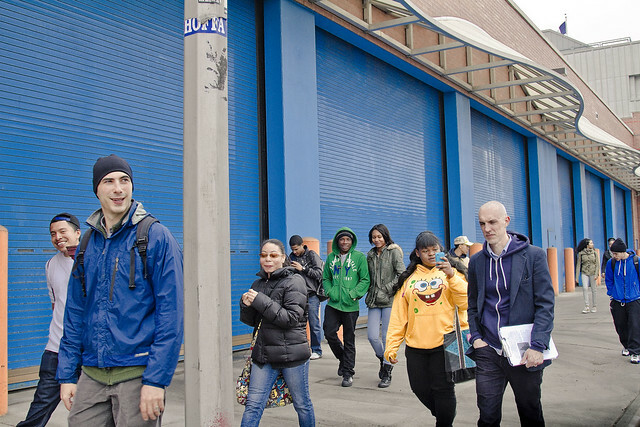 “School to develop and teach a ten week course that instructs 11th grade students on maps-based research methods focusing on two facilities adjacent to Newtown Creek: the Newtown Creek Wastewater Treatment Plant and Waste Management’s Varick Avenue Transfer Station. The selected facilities are the starting point from which the students are examining water and waste systems by geographically tracing the material flows and institutional networks that connect these facilities to the larger world. The students’ findings will be documented using HabitatMap’s community mapping platform and integrated into a maps-based research methods toolkit. 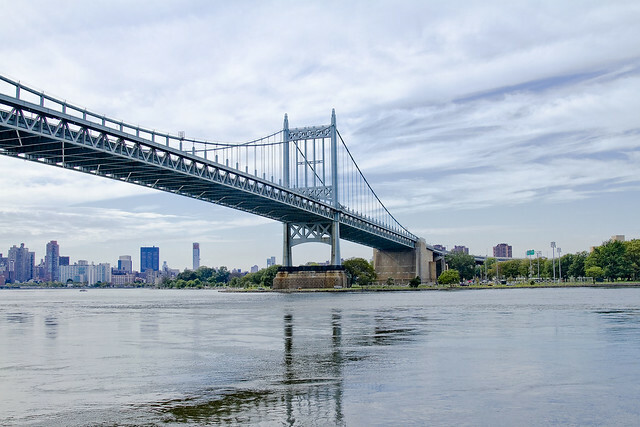 The toolkit will be used by high schools, both in New York and nationally, to conduct investigations of water and waste systems in their own communities using examples from Newtown Creek. 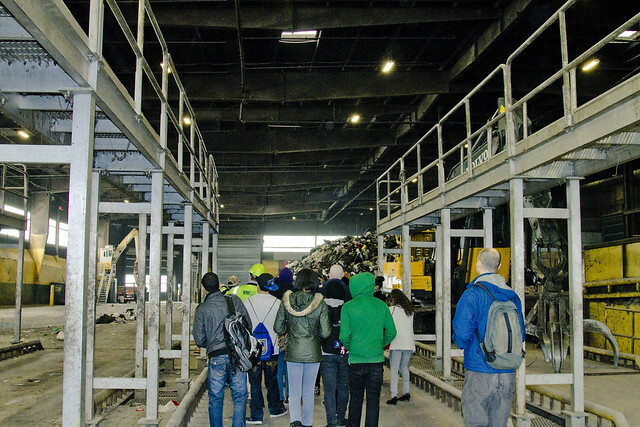 As such class trips have begun since the dawn of time, we were brought to a room where one of the Waste Management superintendents and staff described the process, and procedural habits, of the transfer station. A transfer station, for those of you unused to such terminology, is a concentrating point for the garbage collected by the DSNY and others for sorting and containerizing. The white collection trucks carry their cargo here, where it is loaded onto train cars for eventual disposition into (usually out of state) landfills. 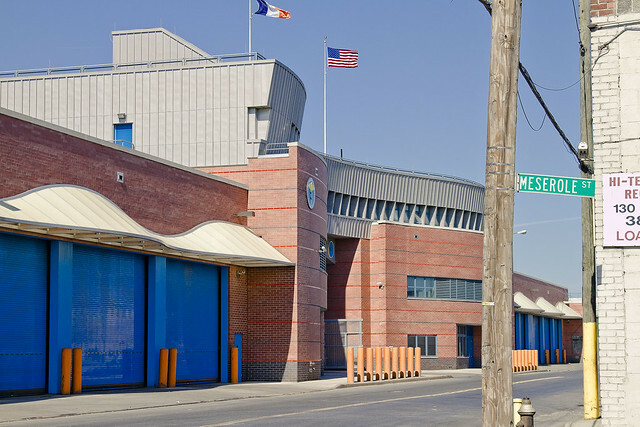 When the DSNY trucks arrive at the facility, they are weighed on enormous vehicle scales like the ones in the shot above. When exiting the facility, they are weighed a second time, and the differential is recorded as the tonnage of waste which was delivered. 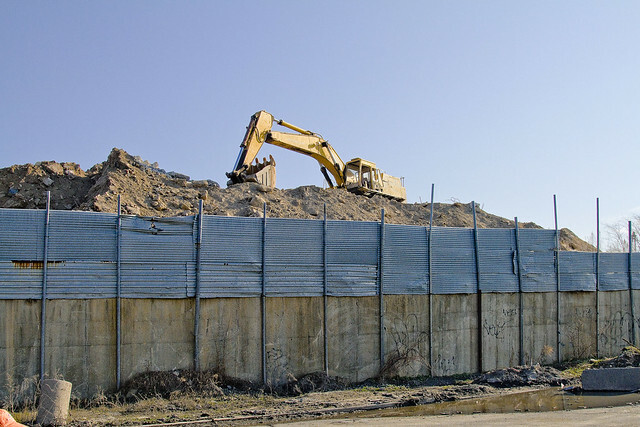 My understanding is that in the contract Waste Management enjoys with the City of New York, the fees paid for the handling of this putrescent lahar are assessed on a “per ton” basis. Other parts of the city’s solid waste plan have moved forward. 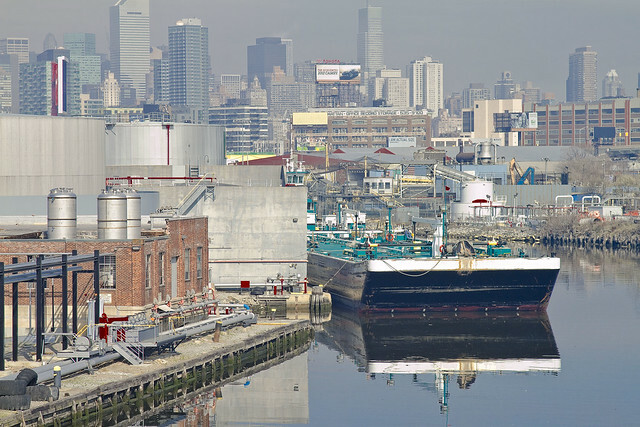 Twenty-year contracts have been either negotiated or are in effect with Waste Management of New York to export trash from Brooklyn, the Bronx and Queens. 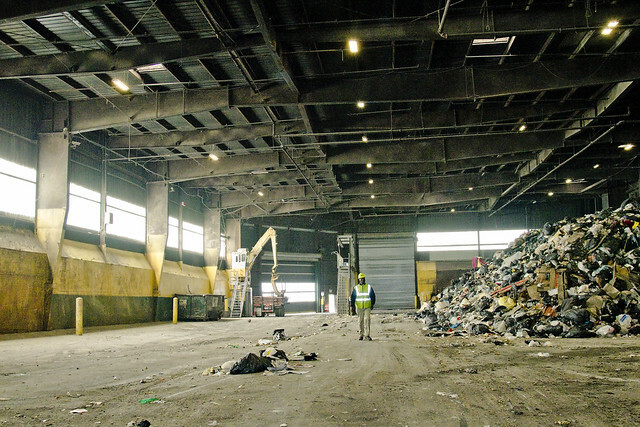 The sanitation department is currently negotiating with the Port Authority of New York and New Jersey for a long-term contract to take the vast majority of Manhattan’s refuse to a waste-to-energy plant in New Jersey. At the time of the solid waste management plan’s approval, the administration argued long-term contracts would save the city money, and it would get the city’s trash off of dirty diesel trucks. 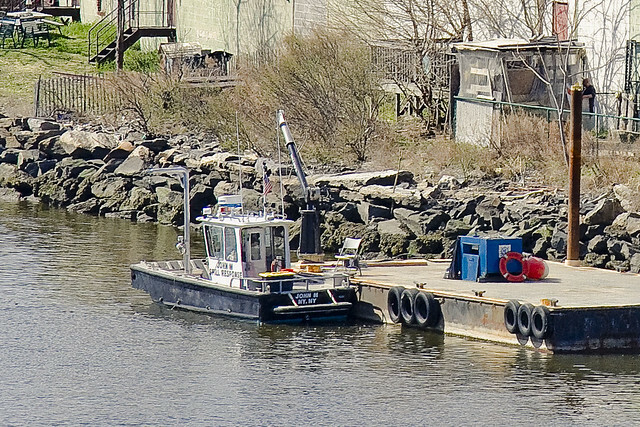 Almost 90 percent of city trash, the mayor promised, would be sent by rail or barge instead. 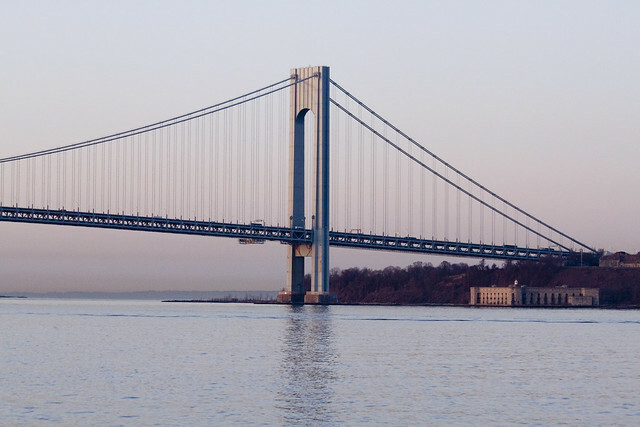 According to the Department of Sanitation, the cost of exporting the city’s trash has increased per ton from $61.30 in 2000 to $92.80 in 2010 — a 20 percent increase over the rate of inflation. 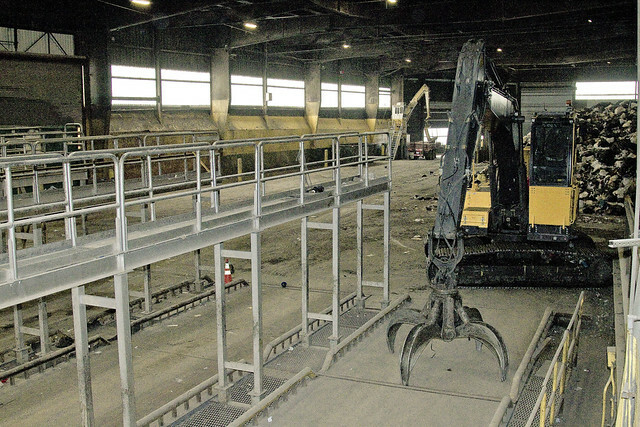 As of April, 33 percent of the city’s trash has been unloaded from trucks and put on rail cars — an increase from 14 percent in 2006, according to the solid waste plan. 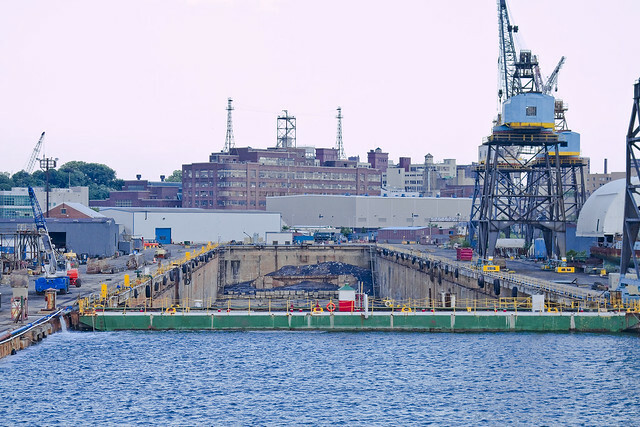 None of the city’s waste is currently exported by barge, according to the Department of Sanitation, because those transfer stations have not been completed. 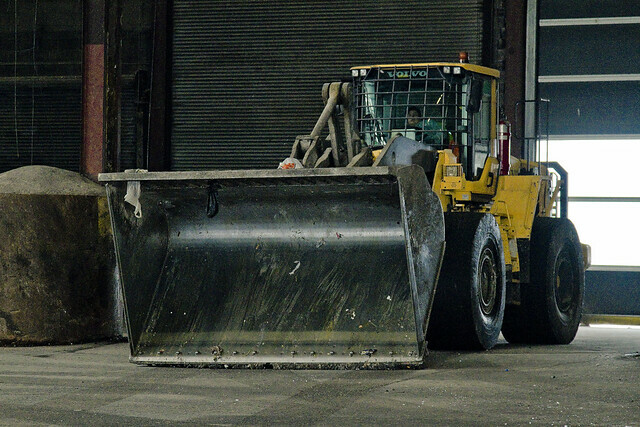 We were informed that our arrival in the afternoon was fortuitous as Waste Management’s schedule is precisely administered to conclude sorting and containerization by a certain time of day which allows them purchase to clean and disinfect their mill. The representatives explained that they are regularly visited by inspection officers and are contractually obligated to several “best practice” regulations. 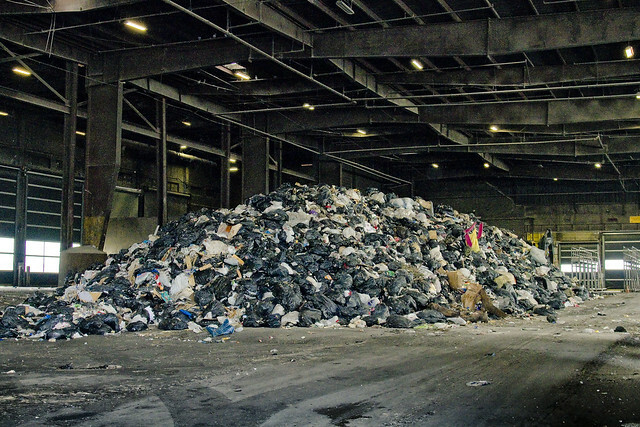 In 2006 Waste Management NY 215 Varick handled 652,706 tons of material; this sum represents 5.3% of all waste exported through transfer stations in New York City. Late in the night and early morning, fleets of collection trucks arrive here, are weighed, and “tip” or discharge their cargo. Enormous machinery, clawed derricks and jotun sized earth moving equipment, flies into action. This can be an enormously dangerous place to work, were routine safety procedures not strictly observed. Even so, extreme caution was urged as we moved into the relatively empty transfer station. Each week, in Fiscal Year 2010, the Department assigned approximately 4,941 trucks to collect 49,922 tons of curbside residential refuse and scheduled 460 E- Z Pack and Roll-on/Roll-off containerized trucks to collect an additional 8,000 tons. 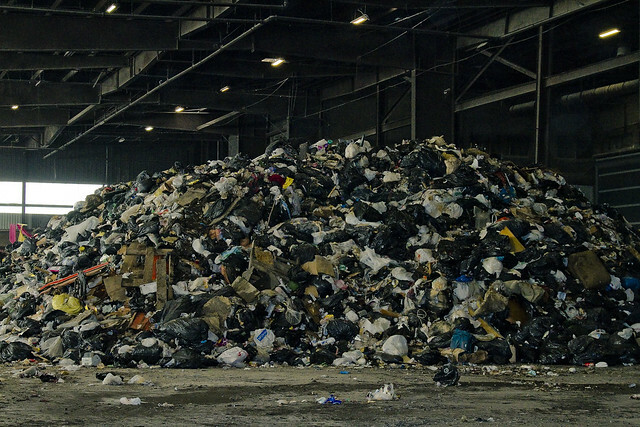 The amount of refuse generated by the 8.2 million residents of New York City is subject to seasonal variations. Each month, the Department allocates weekly truck and tonnage targets to each of its 59 districts to better manage our productivity. These targets are closely monitored to ensure that productivity improvement goals are met. District Superintendents constantly evaluate routes and tonnage in their districts to achieve these targets. The extant mound of trash in these shots was huge, but as mentioned by the Waste Management people, represented only a small fraction of what they handle daily. In fact, they were quite nearly finished processing the daily waste of most of Brooklyn when we arrived. They also explained that the relative lack of odor was due to state of the art equipment maintained at the site which accomplished odor control and elimination via technological means. For scale, this stitched panorama image is included. That’s Mr. Heimbinder in the foreground, and he’s around six feet tall. The trash pile was roughly thirty to forty feet high, and covered a fairly large parcel of floorspace. Any estimate I could offer would be wrong, as your humble narrator is notorious for overestimation of such matters. Somewhere between a regulation basketball court and a regulation football field would be my best guess. The Waste Management crew were waiting for us to exit the facility before they got back to work, and as schedules must be maintained- we were escorted along. Like a lot of the people you meet in the garbage industry, they were really nice and seemingly “regular joes” who took their jobs seriously. 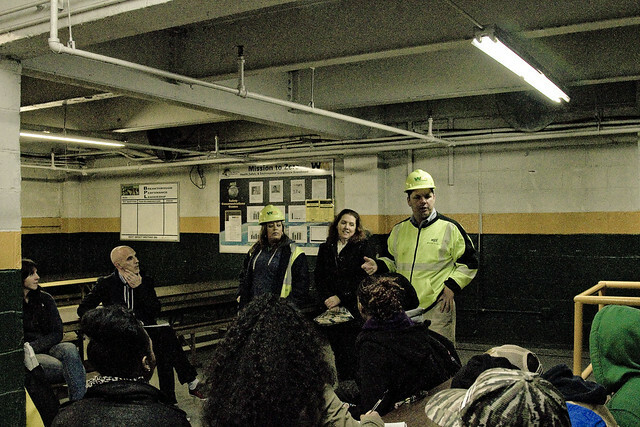 A few of the Waste Management and DSNY personnel who were on site also talked to the kids, assuring them that these were “good jobs” with great pay and a full package of benefits. Your humble narrator knows quite a few people employed in this industry, at both public agencies and private carting firms. None of them regret their choices, career wise, but for the early start time which is common at such jobs. Most of the folks I know who are engaged in this trade leave home before the sun comes up, arriving at work by 5 A.M. or thereabouts. Often, a change of clothes is kept in the trunk, as their work clothes can become quite soiled as the day goes on. After a shower, you’d never know what they do for a living. An appointment in Greenpoint carried me across the Greenpoint Avenue Bridge last Tuesday, and as my habit is to be early to meetings, some time was available for photography. It was an unusual and foggy day, and the mists were creating an enormous depth of field atmospherically. 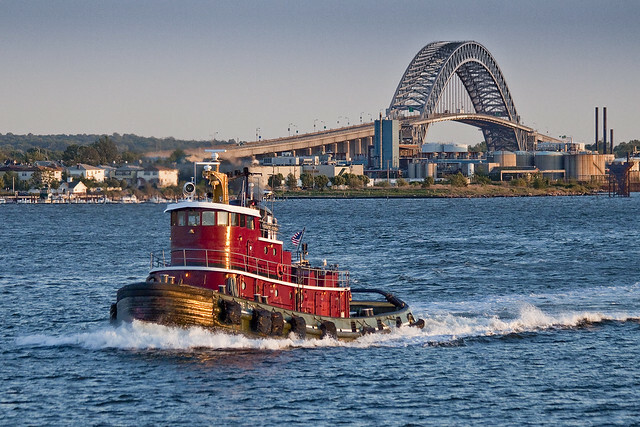 Always a visual pleasure, the GPA bridge offers views of the former Tidewater pumping station on the Queens bank as well as the tank farms of Lukoil and Metro fuel on the Brooklyn bank- which are pictured above. That’s when I noticed something disturbing. 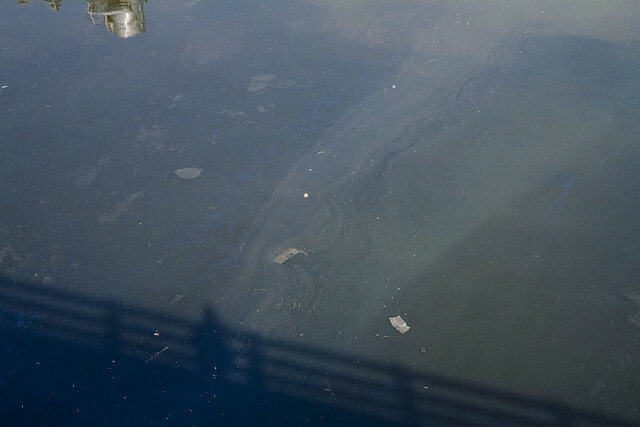 We are lucky that we live in the age we do, when an oil slick moving down the languorous Newtown Creek is a remarkable sight. Once upon a time, such visualizations were commonly extant and regularly observed. Luckily, due to regulation and improved industrial practices, such events happen far less frequently than they once did. 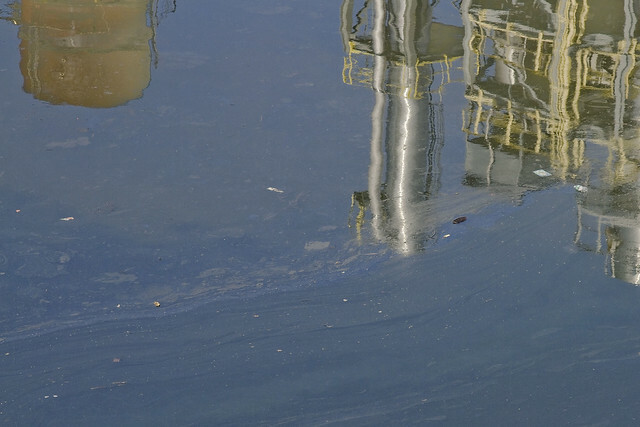 The standard protocol to follow when you observe an oil slick on the Newtown Creek, or anywhere in New York Harbor, is to first document it by taking a picture using your cell phone or digital camera. Make a note of your location and the time. Next, call 311 to alert city authorities, followed by a call to the State DEC spill hotline- 1 (800) 457-7362. They take these matters quite seriously. Take note of whether the tide is coming in or going out, as this will help authorities to pinpoint the source of the contaminants. On this day, the tide was ebbing and the oil slick was flowing toward the East River along the tepid current. It should be mentioned that the obvious petroleum industry presence found alongside the Greenpoint Avenue Bridge is maintained by fairly responsible parties in modernity, and the shot above is not meant to indite or should be viewed as indicative of being responsible for the event depicted in this post. 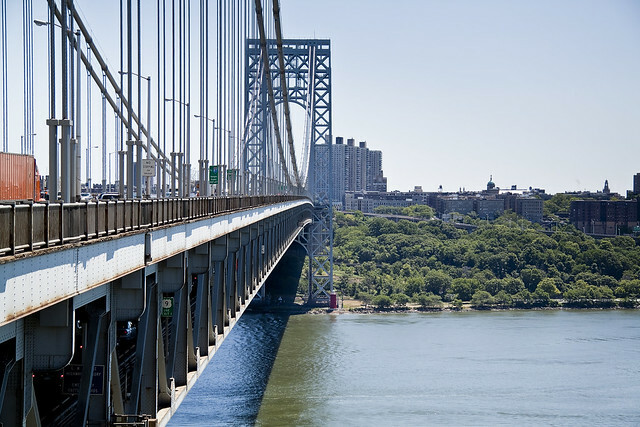 The slick was coming from the other direction, flowing east to west and traveling beneath the bridge toward them. 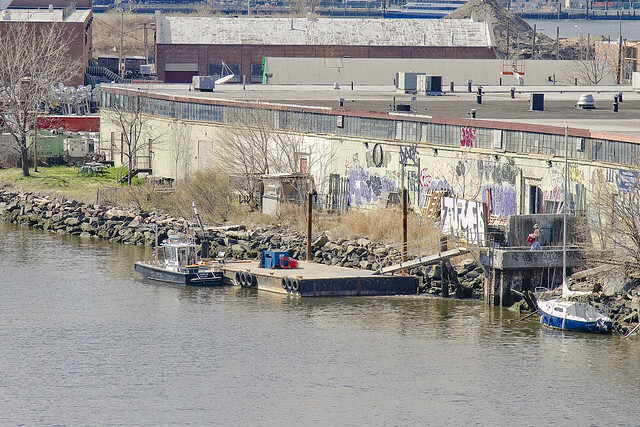 Later that afternoon, after having accomplished my intended goals in Greenpoint, and returning home via the Pulaski Bridge to Queens- a new feature on the lower Creek was noticed. 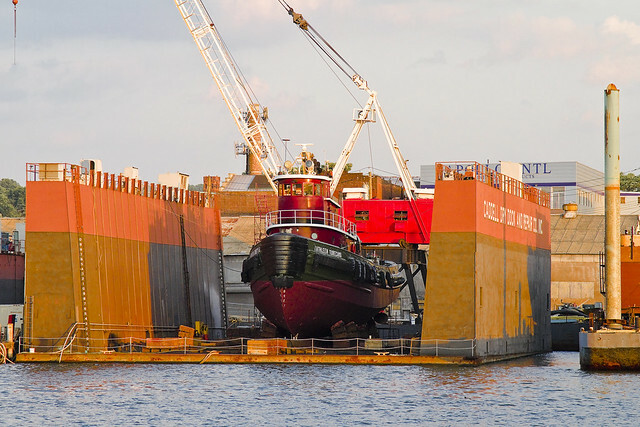 A temporary or floating dock installed nearby the Vernon Avenue Street End, and one of two “work boats” was traveling eastward from it and moving under the Pulaski. It moved too fast for me to ready the camera, but it bore the screed “spill response boat” upon it. Everybody’s friends at Riverkeeper, whom I informed of my observations upon returning home, made inquiries with DEC officials about the nature and extent of this possible spill event. 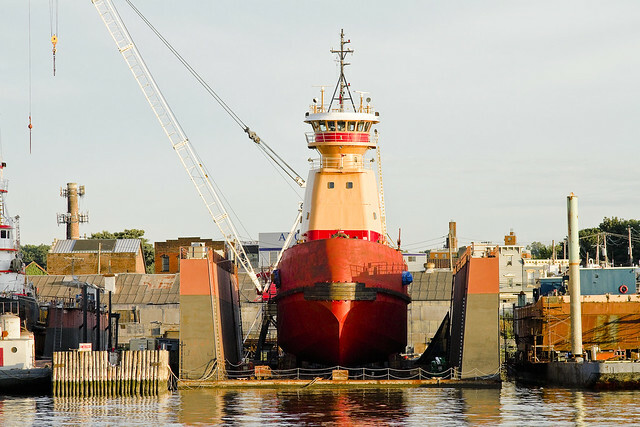 DEC sent back word that the slick was no spill, rather it was likely a result of sediment sampling efforts being carried out by the Federal EPA as part of the ongoing discovery phase of the Superfund process. It seems that while dredging up small quantities of the so called “Black Mayonnaise” which lines the bed of the creek for study, some effluent might have been released into the waterway.